Interior designer Steve Toedebusch can transform a 20th century home into a 21st century statement of warmth, style, and comfort. He brings a flair for creating a living space that balances art, openness, and warmth. One of his recent successes is in Carlyle, a gated community in west St. Louis County. Steve took on the challenge of updating a home that was full of Pop Art and Expressionist works from Warhol, Stella, Johns and others. 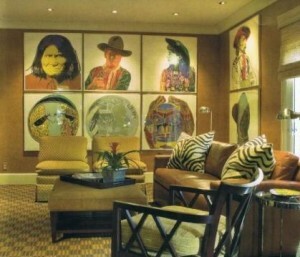 In the family room, Steve used “faux leather walls and a Coach leather sofa with animal print pillows to accent the contemporary design of this sophisticated room”. Steve is a big fan of animal prints. He freely uses them as carpets, wall coverings, and fabrics to effect a contemporary or traditional look, depending on the application. As he puts it, “They always say style”. Steve Toedebusch has been an interior designer for over 30 years. His background includes Fine Arts and Interior Design. He has worked on commercial and residential projects across the country—many of which have been published and currently accepted for Architectural Digest. He is based out of Frank Patton Interiors in St. Louis as well as Palm Springs, California.